One one time or another, every paddler will capsize in their boat. 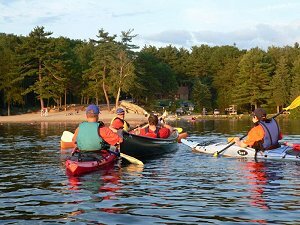 Knowing how to handle the situation if you swamp, and knowing how to assist others, is an important skill for every paddler. 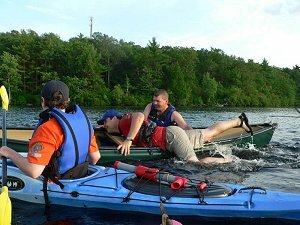 The following pictures were taken during a canoe recovery demonstration at the Blackstone Valley Paddle Club Training Night on July 6th. 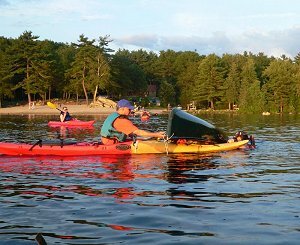 The first step to safety takes place on shore - always wear your life jacket or PFD. 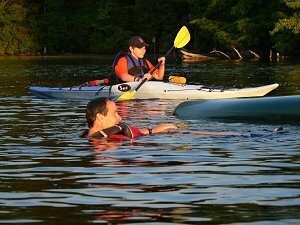 In this picture, the swimmer floats easily in his PFD near his capsized boat while deciding the proper course of action. If close to shore, swimming or wading back to shore is usually the easiest and safest option. In the middle of a lake where swimming to shore is not an option, re-entering your boat from the water may be necessary. With a canoe, this usually means a boat over boat recovery. In this picture, the up-side-down canoe is pulled on to another boat to begin emptying the water. 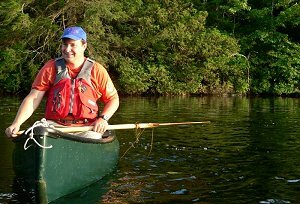 With the empty canoe resting up-side-down on the another boat, it is easy to roll the canoe over and return it to the water. 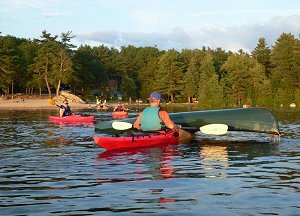 With the canoe empty and floating freely in the water, the swimmer can climb back into the boat. 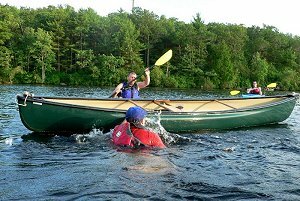 In this picture, another paddler moves into position to brace the far side of the canoe and assist the swimmer in reentering. With a strong kick, the swimmer lifts his body up into the boat until his hips are across the nearest gunwale. The swimmer then rolls on to his back and sits in the bottom of the canoe. Other paddlers help the swimmer recover his paddles and gear. If the canoe took on water during the reentry, it can be bailed or pumped. The paddler safely back in the boat. Thanks to Erik Eckilson, Kent Cameron and Wayne Leary for participating in this demonstration. Pictures by Cheryl Thompson Cameron.